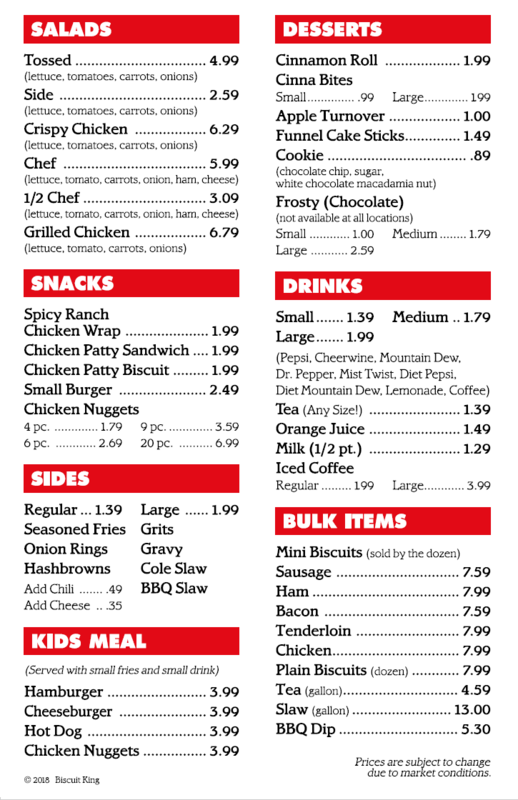 The "Best Part of Any Day" is coming to Biscuit King for a homemade biscuit. 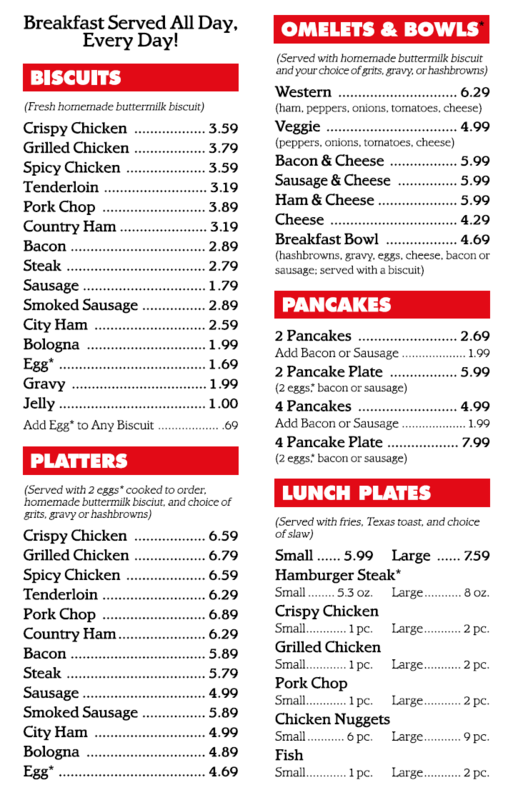 You can have your choice of Country Ham, Tenderloin, Bacon, Sausage, Chicken, Steak, Cheese, and Egg. Try our 1/3 lb. Juicy Ground Chuck Hamburger or Cheeseburger, and our Grilled Hot Dogs, and don't forget our great Fries! 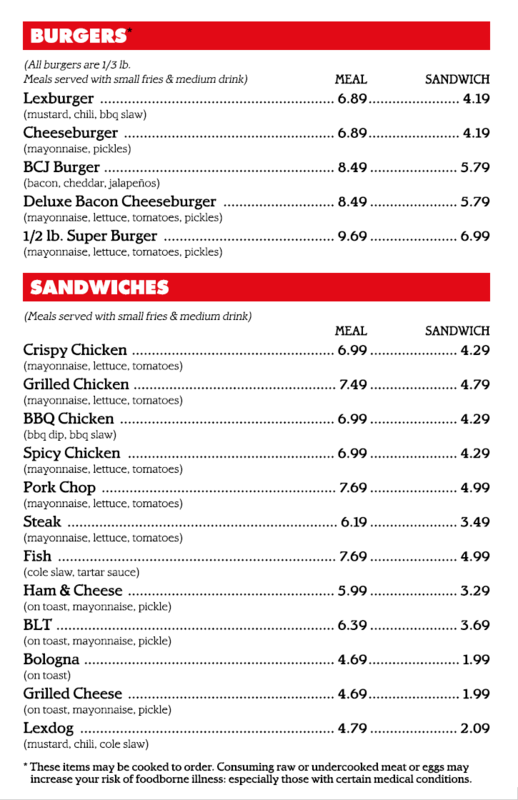 "Delicious"
All Menu Items are served all day 7 days a week. Want Fries at 5 in the Morning? "You Got It! " Want a Biscuit at 3 in the Afternoon? "You Got It! " Want Chocolate soft-serve ice cream Anytime? "You Got It! " Where You Belong and Feel Comfortable and Get Great Food! Over 20 years ago Biscuit King was a small 20 seat restaurant with 5 employees. We were known as the little yellow building on the corner. 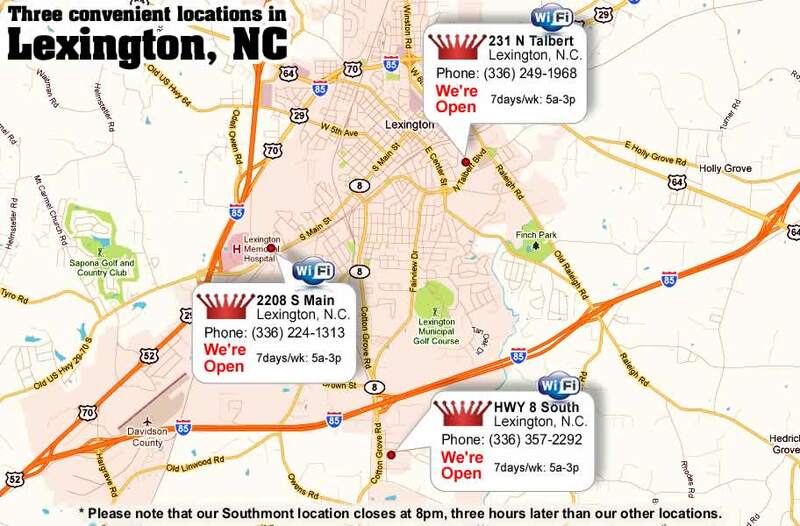 We have now grown to three 100 seat restaurants, with Double Drive-Thru Windows at all locations, with over 50 employees. All Food orders are made fresh. You as a customer deserve to have the Best Quality Food, served with courteous service, at the best price. We hope our quick service, friendly atmosphere, and the excellent quality of our food meet your expectations. Complete satisfaction of each customer is our goal. We welcome all comments and suggestion you may have. "Behind the Scenes" video and you'll see why Biscuit King is known for the very "Best Quality, Best Service and Best Price". From all of us at Biscuit King, Have a pleasant day and come visit us again soon!